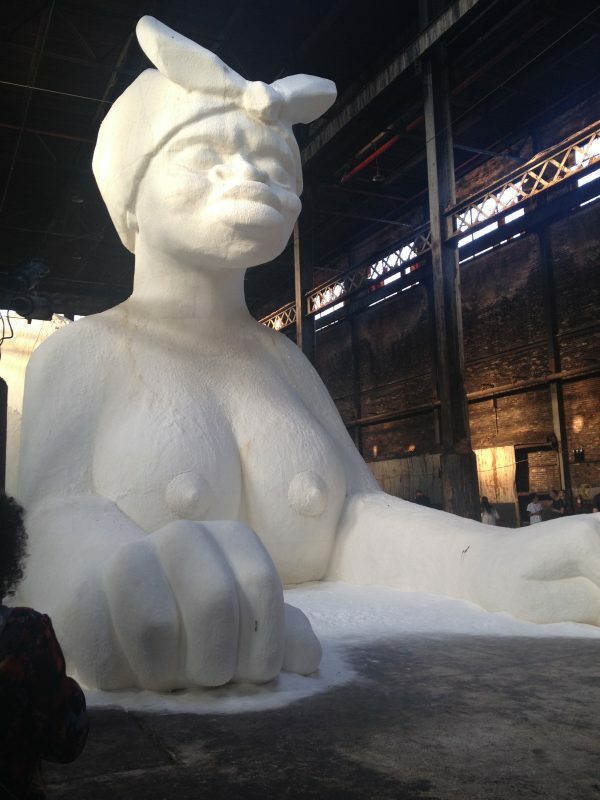 A Subtlety by Kara Walker, Domino Sugar Factory, Brooklyn, 2014. Presented by Creative Time. Photograph by Gigi_nyc. Previous Artful City posts chronicle recent developments and historical perspectives on the public art landscape in Toronto, providing fantastic insight for those interested. The very existence of the Artful City series, as well as numerous recent initiatives, suggest that there is indeed a growing interest in public art. This is welcome news for those of us who have been working in this arena for some years. In 1986 Toronto became the first municipality in Canada to create a clear policy for public art as part of major City developments. The Toronto policy framework became the template for many other municipalities across the country who were also looking to foster investment in public art. Today, however, Toronto’s policies appear stale and in serious need of updating. While the city started out as a national leader, it is now at risk of falling behind other municipalities regarding opportunities available to artists and the public. Unfortunately, Toronto is stuck in a paradigm that severely limits what is accepted and defined as public art. Currently in Toronto, public art is defined by both policy and budget as something that is permanent. Public art is treated as a capital expenditure – built once and intended to last forever (or at least 50-100 years). This requirement for permanence creates a significant barrier to supporting the growth of temporary public art programming – which can often be more flexible, accessible and daring. Under the current rules, temporary installations are not eligible to receive public funds linked to Section 37, the primary funding tool for public art in Toronto. As a result, Toronto is lacking an art experience that is now widely accessible in other cities and recognized as providing key outlets for civic dialogue and debate. One notable and longstanding exception to Toronto’s policy of only funding permanent public art installations is the Toronto Sculpture Garden. In her post Rina Greer, long time Executive Director of the Sculpture Garden, outlined the relevance and history of the site as a unique platform for temporary public art in the city. The Sculpture Garden was the result of a unique funding arrangement between the City and the Odette Foundation and was instrumental in Toronto’s art ecosystem as a testing ground and incubator for artists venturing from galleries into the public realm. The fact that this program was a fixture in the art scene for 25 years and didn’t serve as a precedent for similar programs in other sites of the city shows how unique that set-up was and how restrictive the current policies are. The Toronto Sculpture Garden is the exception that proves the rule. Early in the 2000s, thanks to growing public interest in public art, changing attitudes in the city government and substantial commitments of private and public funds, Nuit Blanche and Luminato were both launched in Toronto. They provided new opportunities for the public to engage with temporary art installations. While these two festivals have done a lot to expand the art audience in Toronto and foster new dialogue about the role and purpose of art experiences, both Nuit Blanche and Luminato are above all festivals, where artworks are a part of a broader program that takes art to the streets for a brief period of time and then departs. Artworks from Luminato and Nuit Blanche are not expected to stand on their own, within the day-to-day urban environment and change how people interact with their city. My previous contribution to the Artful City, “On the Waterfront, building public art collections in Toronto’s newest neighbourhoods”, concluded with the idea that art in public is the most human element of city building: it is the opportunity to tell a story, perhaps even a joke, ask a question or focus attention on some inherent quality of the site that may not be obvious, but makes that site unique. However, when a piece is going to be sited in a location in perpetuity, the artist and commissioning body have to think long term. Subject matter has to be as relevant in 50 years as it is the day it is unveiled. Materials are limited to those that can weather harsh climates, and while art is subjective (and there is always going to be someone who doesn’t like what is built or the very fact that it is built) the aim in commissioning is to create something that will become a positive fixture in the community, something for which the overwhelming reception will be positive. In other words, permanent public art will always have to play it safe. Platforms for temporary art installations present a safe space to be unsafe. Temporary public art programs can push buttons and boundaries far more than permanent ones. They can ask questions that are as provocative as those asked in a gallery. They can elicit conflicting responses and heated debate. The work is not going to be there forever, but a growing legacy of civic engagement and dialogue will be, and as it grows so does an audience more comfortable with the sometimes uncomfortable questions art can really ask. Remember “The Gates” in New York, the bright orange serpentine textile installation in New York’s Central Park by modern art heavyweights Christo and Jean-Claude? It was made possible through a combination of private and public funding in partnership with New York based non-profit organization Public Art Fund. A huge part of their magic and the stupendous level of excitement they caused was due to the fact that they were only there for a limited time. Like a holiday, it is special in part because it won’t last. It shows you a different way of being and it changes you, even if only a tiny bit, forever. 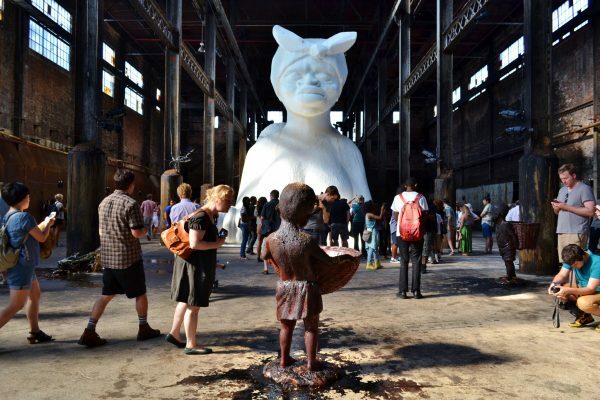 Also in New York, Creative Time lit up the twittersphere in 2014 with Kara Walker’s “A Subtley; or the Marvelous Sugar Baby”, which saw droves of people making the trip to Brooklyn’s abandoned Domino Sugar Factory. Visitors were confronted by an artwork that was the opposite of subtle. There was no need for this artwork to be tame because it was only going to exist there long enough to ask some purposeful questions, and then depart, leaving those questions hanging in the air like the smell of burnt sugar: pungent, delicious, repellent, and indelibly imprinted in people’s minds. A Subtlety by Kara Walker, Domino Sugar Factory, Brooklyn, 2014. Presented by Creative Time. Photograph by inga. 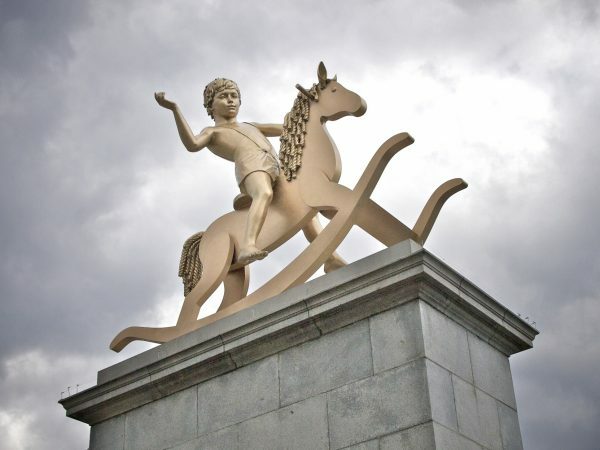 The Fourth Plinth program at Trafalgar Square in London features sculptural works from leading contemporary artists installed for periods up to two years. The works respond to the site with provocations that would not be permitted of works that were intended to sit there permanently. While three of the four corners of the square host British Generals and a King, the artworks commissioned for the Fourth Plinth often make pointed remarks about what we monumentalize, what aspects of our history we celebrate versus those stories and traits we typically sweep under the rug. The fourth plinth is sort of a peek under the rug. Powerless Structures, Fig 101 by Michael Elmgreen and Ingar Dragset, London, 2012. Photo by Stew Dean. The Toronto Sculpture Garden, Nuit Blanche and Luminato have done a lot over the years to build an appetite for art in public. There seems to be more interest than ever in Toronto and individual donors are turning their attention to public art. The Bentway and Ribbon at the Lower Don (both projects currently in development and coming soon, managed by Artscape and Evergreen Canada respectively) are two public art programs that are coming to fruition thanks to interested private citizens putting their own dollars into this brave world of temporary programming. Given this environment, now is a good time to revisit the rules and definitions (and therefore funding) that govern the City’s support for public art. A space can be opened up to allow for a greater diversity of art experience in public. Private citizens are stepping up. Public policy has to try to keep up. The City should consider how existing resources – those that have traditionally been earmarked exclusively for permanent public art installations – can be used more flexibly to support a diversity of art experiences and temporary installations in particular. One possibility would be to allow some of the public art funding to be spent on permanent infrastructure that would support temporary programs. This kind of model could apply to the Bentway project mentioned above. 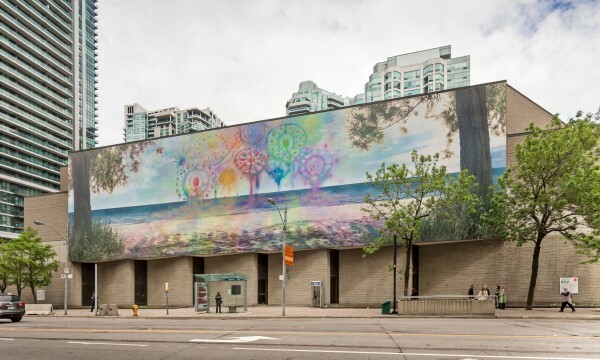 In my position at Waterfront Toronto, I helped facilitate the occupation of a giant blank wall at the bottom of Bay St with not only an enormous photographic mural by Sarah Anne Johnson, but an aluminum frame that will long outlive the colours of its current content. This project was the result of some collaborative thinking on the part of Street Art Toronto and CONTACT Photography festival with generous financial support from the individual donors who make up Partners in Art. The frame is now a semi-permanent platform for photo-murals on an enormous scale; the opportunity and infrastructure now exists for some pretty provocative temporary work in a high profile location. Similar platforms could be funded and built elsewhere in the city with public art capital projects funding the infrastructure and including an endowment to offset the operating costs of organizational partners who could take on the programming. Another possibility is to look at changing when public art funds are collected and spent. According to the City’s prolific Percent for Art program, public art is defined as a “community benefit”. Funds are released when a developer goes for their above grade building permit. Before this, sites sit empty. What if “community benefit” could start ahead of bricks and mortar building and include temporary programming of the empty lots during that in-between time when they are no longer parking lots, and not yet condos? In 2014, Toronto City Council passed a report recommending that developers erecting hoarding around construction projects be required to pay a monthly fee which can be directed to the City’s arts and culture operating costs. This has largely translated to hoarding projects hosting temporary public art murals. This sort of policy structure begins to open the door for other discussions about art in public as an operating cost, instead of strictly a capital expenditure. At Waterfront Toronto, I see tremendous opportunities for art to lead development in the Port Lands area, with temporary activation of any number of the derelict sites. 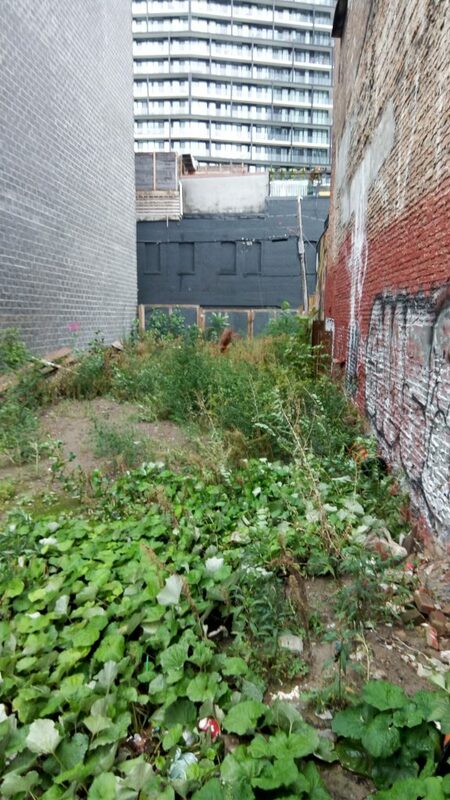 Beyond the Waterfront area, downtown is dotted with empty lots like the one right in the middle of a dense strip on Queen Street West, or the corner of Sherbourne and Gerrard, which had been growing weeds for more than a decade, or the closed down LCBO at Yonge and Davisville. If rules were changed and definitions opened up, these fallow lots could become sites for temporary works, opportunities for Torontonians and visitors to experience something different which changes us and our relationship to the city, if only a little bit, forever. Rebecca Carbin holds a Masters in Contemporary Curating from Goldsmith’s College, UK. She has worked with Artangel, Public Art Development Trust, and Saatchi Gallery. As Public Art Officer at City of Toronto, Rebecca opened up opportunities to artists working in different media and at different stages in their careers. Rebecca is Public Art Program Manager for Waterfront Toronto and is also Founder of I Heart Your Work Art Futures.